I'm still in soup groove. Have you had enough yet? Do you feel like saying no more soup Jac! I'm just loving it. I'm so busy and so very tired at the moment, it's just what I need and it feels good to feed myself and my family something simple, but nutritious. My soups often start with raking in the fridge to see what I have. This time I had carrots, parsnips, potatoes and half a butternut squash. Excellent! This soup is perfect for the 5:2 Diet. 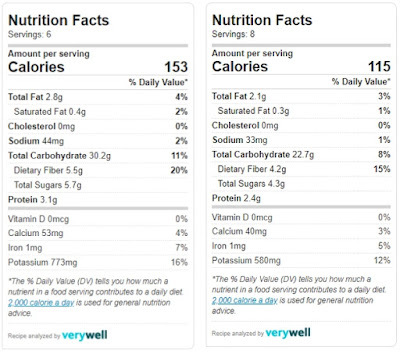 Divide it into 8 servings and you are only looking at 115 calories per bowl. 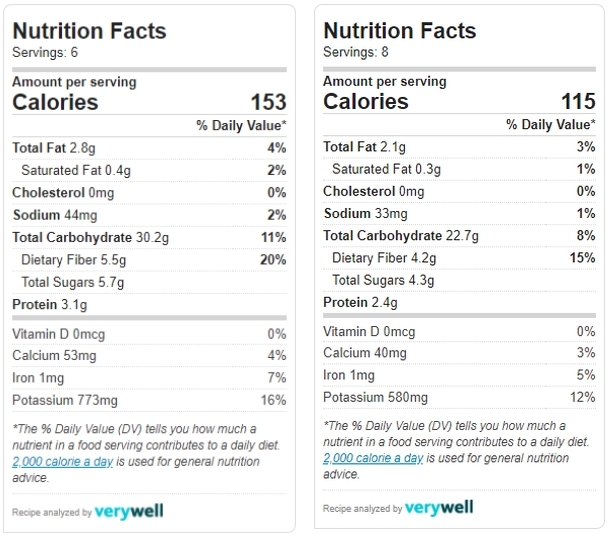 Divide it into a heartier 6 portions and you are still only looking at 153 calories. The new 5:2 diet is even more generous and allows men and women 800 calories on their 2 fast days a week. Check out my 5:2 diet page for more information and recipes. My soups often start with looking in the fridge to see what I have. 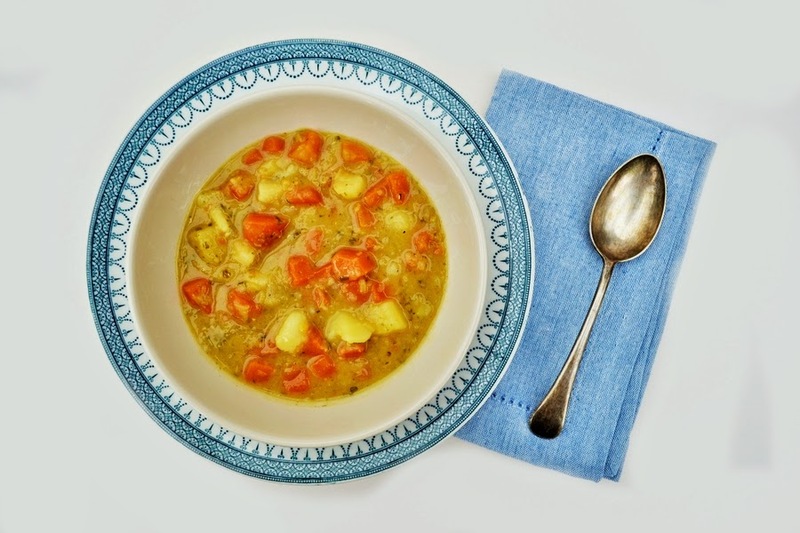 This time I made a comforting and filling winter soup with carrots, parsnips, potatoes and half a butternut squash. Absolutely delicious! in the olive oil until soft. Add the vegetables as you chop them, this will give them a chance to soften a little as you go. Add the spices and stir in, then add the stock. Bring to a boil and then reduce the heat and simmer for 30 minutes. Nutrition info is based on 8 servings. For more tasty veggie recipes and ideas, follow me on Pinterest, Twitter, Facebook and Instagram. You can also subscribe to my newsletter by filling in the form on the sidebar. 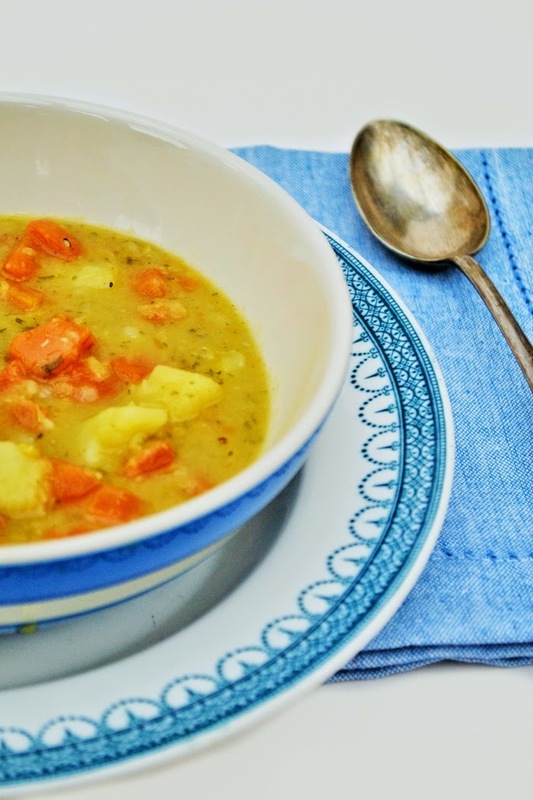 I love soups any old way - especially when it helps to clear the fridge - this sounds like exactly the thing I need in winter and could eat in summer anyway! I always forget you are at the opposite ends of the season from us Johanna, but yes, soup is always good. That looks so comforting Jac- I mean this in a good way, but it reminds me of a soup my Gran made, which was lovely! Ah that is a lovely compliment Stuart. Ah yes, we are all making big pots of soup to keep us warm! This looks like a nice combination of ingredients. Beautiful pictures of your soup Jac, I love the blues! Soup is always a good idea in my book, and this one looks lovely! Always love a goof bowl of soup Jac! I am with you in the soup groove, OH keeps begging for us to eat other things. Haha that hasn't happened here yet, but probably quite soon! I'm with your husband on needing soups with substance. Otherwise I reach a little too often to the bread bowl! I like both, but there is something satisfying about a chunky soup. Me too Becca and it is definitely soup time of year. I love chunky soups like this and find them so much more satisfying, my kids weirdly prefer smooth soups. I think they are great for using up veggies lying around, and cheap too! I wonder if there is something in who likes smooth and who likes chunky personality wise? This looks comforting and delicious. I wish I had a bowl in front of my right now! Me too Emily, I'm feeling a little chilly! Love this soup Jacs and I have all the ingredients, just wish I could stand still for long enough to make it today!